Busan is the second largest city in Korea and located on the southeastern tip of the Korean peninsula. 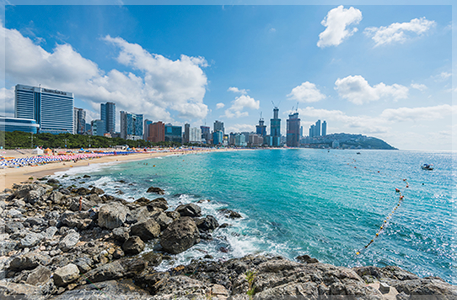 The natural environment of Busan is a perfect example of harmony between mountains, rivers, and sea. Its geography includes a coastline with superb beaches and scenic cliffs, mountains which provide excellent hiking and extraordinary views, and hot springs scattered throughout the city. 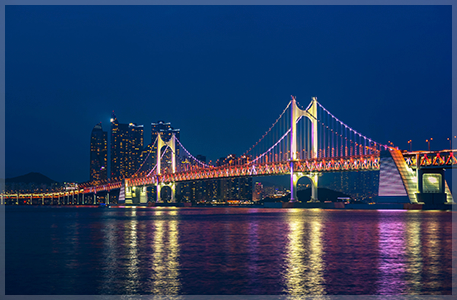 The city's natural endowments and rich history have resulted in Busan's increasing reputation as a world class city of tourism and culture, and it is also becoming renowned as an international convention destination.